"Levi,Lance,Louis,Lilly,Libby And Lloyd's First Run In The fall 2016 In A 10 Dog Team"
"Libby & Lloyd's 6th Run In Harness @ 81/2 Months 04/10/2016"
"Levi & Lance's 6th Run In Harness @ 81/2 Months 04/10/2016"
"Louis & Lilly's 6th Run In Harness @ 81/2 Months 04/10/2016"
"Perle's First Run At Lead 10/04/2013!" "First Run Of The Season 09/27/2013 "B" Team!" "First Training Run Of 2013/14 Season "A" Team!" "Hobbits First Hookup, May 2013!" "SPRING EXERCISE @ LAC CHARLAND!" "Defi Taureau, Saint Michel des Saints 2013!" "TRAINING RUN 12/24/2012 AFTER THE STORM !" "Second Day Of Training 2012/13 Season"
"First Runs of 2012/13 Season,9/24/2012"
"Finishing Off The Year 2011!" "TRAINING RUNS ON DECEMBER 2,2011"
"Last Half Of 4.5 Mile Training Run With Two Rookie Leaders"
"Training Run With Second Half of Unlimited Sprint Team"
"Training Run Half Of The Sprint Team, 11/6/2011"
The third run with the Unlimited Class Sprint being divided into two teams of nine dogs. This Run Max & Cobalt @ lead. "ONE, TWO MINUTE INTERVAL DURING A TRAINING RUN!" This video is an example of a two minute interval in my Fall conditioning/training program. After the two minute run the dogs get a two minute rest. The next interval in the conditioning program will be a three minute run & a two minute rest. After 100 miles of conditioning/training the team should be able to run this 4.5 mile trail without any rest & maintaining an acceptable basic pace. "TRAINING RUN WITH SPRINT TEAM ON THEIR 5th RUN OF THE SEASON!" Sprint Team on their 5th training run of the 2011/12 Season with Cobalt & Max at lead. "FIRST FALL CONDITIONING/TRAINING RUN 2011!" 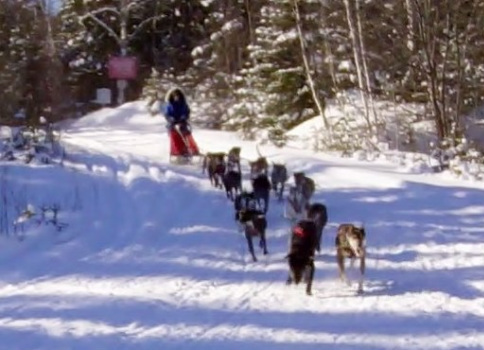 The video is of the Sprint Dogs (exception Amorook @ Lead) on their first run of the new season. Cosmos got loose when changing leaders a half mile from the Chalet on the return trip. Not the best way to introduce a new leader. Upon return to the kennel Cosmos visited the puppies and waited for me where we normally finish the run. Two yearlings ( Indigo & Blue ) had their first run in a team and did great. Blue can be seen in the video, he is the dog on the left one position up from Wheel. Amorook & Leo are all ready to start Fall conditioning!